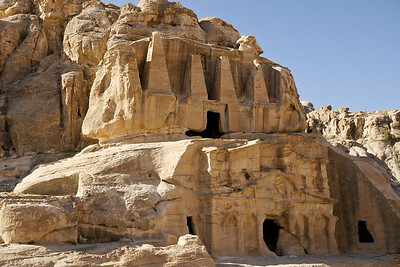 The rose-red ancient city of the Nabataeans in Jordan; a UNESCO site featuring beautiful rock-cut architecture and structures from B.C.E. 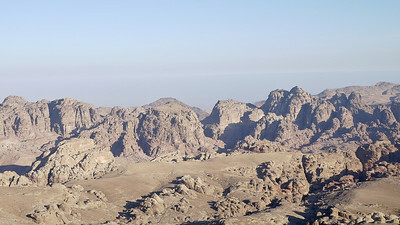 Huge rocks dot the landscape near Wadi Musa, Jordan. 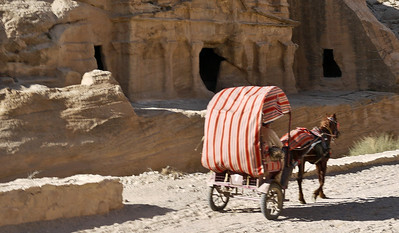 Horse-drawn carriages take tourists deep into Petra, Jordan. 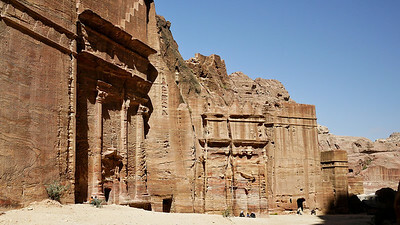 Elaborate cut rocks in Petra, Jordan. 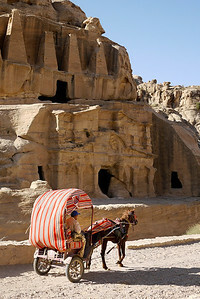 A carriage in front of some of the rock-cut tombs and structures in Petra, Jordan. 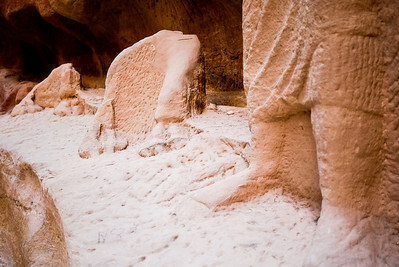 A small area for local gods and statues in Petra, Jordan. 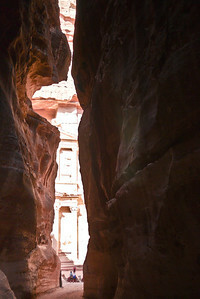 Tight alleys lead through to the Treasury in Petra, Jordan. 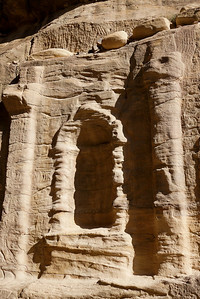 Cut stone remains visible after centuries inside Petra, Jordan. A lone tree stands against the tall rocks, the bench is a comparison for the size of Petra, Jordan. 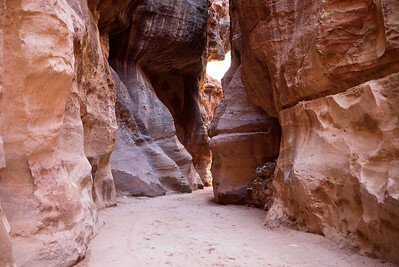 A small, wide area on the way to the Treasury inside Petra, Jordan. 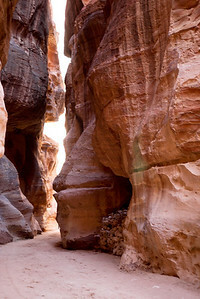 Red rocks extend into the sky on every side as you wide your way into Petra, Jordan. 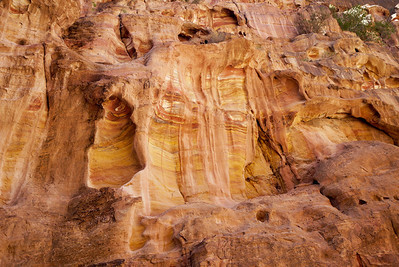 A Petra cat in Jordan! 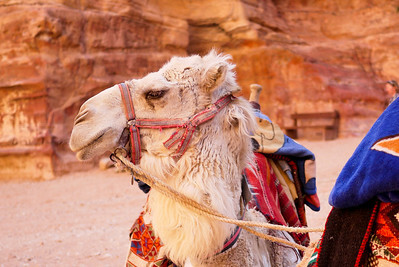 And he matches :). 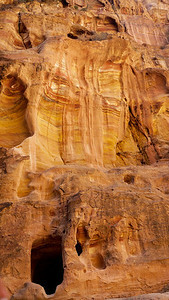 Beautiful orangy-red rocks illuminated in the early morning hours at Petra, Jordan. 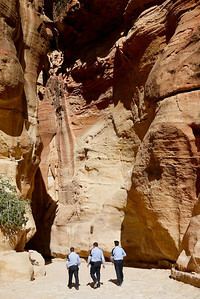 The red sandstone is beautifully illuminated with sunlight in Petra, Jordan. 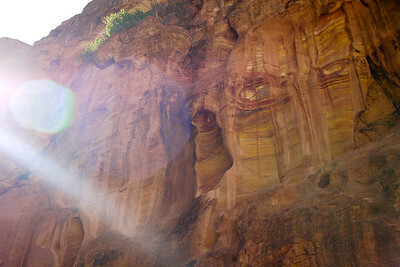 A slice of sunlight lights up Petra, Jordan. 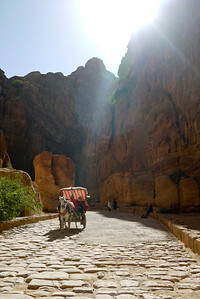 Tourists ride a horse and carriage toward the Treasury in Petra, Jordan. 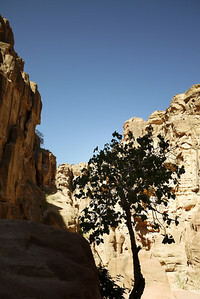 Keeping the order on a quiet day inside Petra, Jordan. 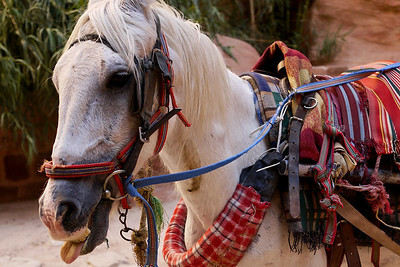 A silly horse at Petra, Jordan. 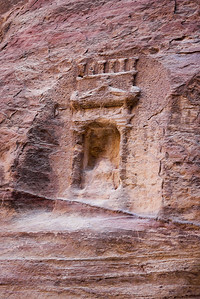 A gorgeously detailed carving remains of a Bedouin and his camel inside of Petra, Jordan. 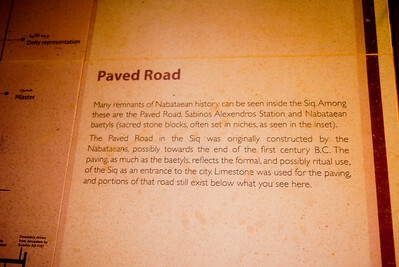 Sign giving details of Petra, Jordan. 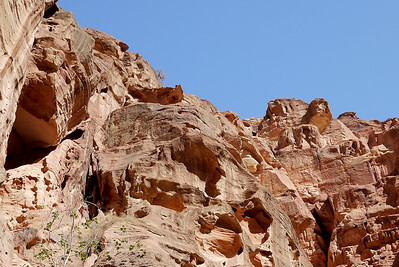 Blue skies and red rocks at Petra, Jordan. 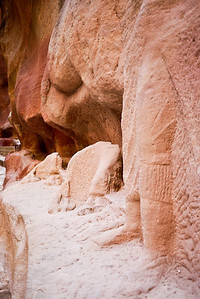 A camel and Bedouin, small pieces of the carvings remain at Petra, Jordan. 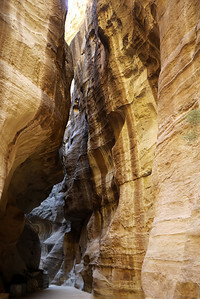 A carved channel to carry water deep inside of the ancient Nabataean city of Petra, Jordan. 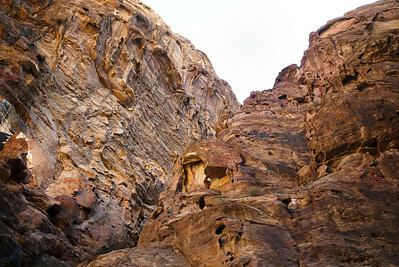 The beautiful walls of the Siq leading to the Treasury in Petra, Jordan. 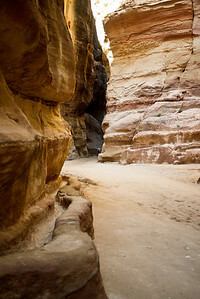 The Siq, a narrow hallway leading to the Treasury in Petra, Jordan. 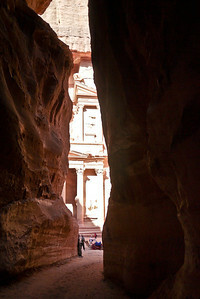 A peep-hole through the Siq as you approach the Treasury in Petra, Jordan. 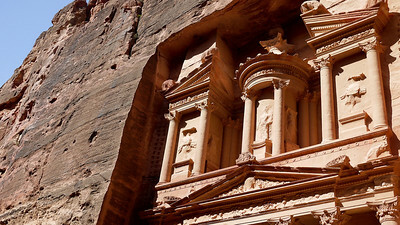 The Treasury appears slowly as you walk through the Siq in Petra, Jordan. 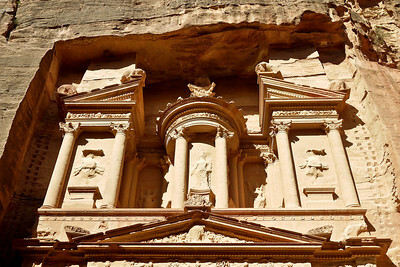 The Treasury in Petra, Jordan. 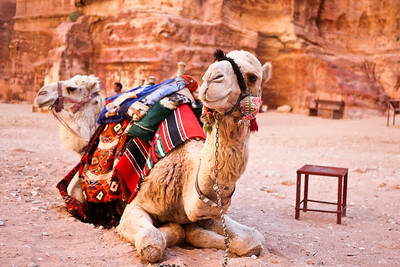 A camel waits for riders at The Treasury in Petra, Jordan. 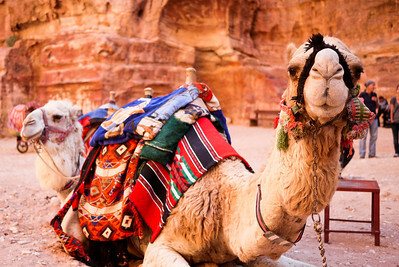 Camel action at The Treasury in Petra, Jordan. 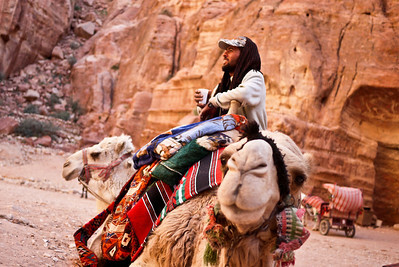 Camel action as the Bedouin wait for riders in Petra, Jordan. 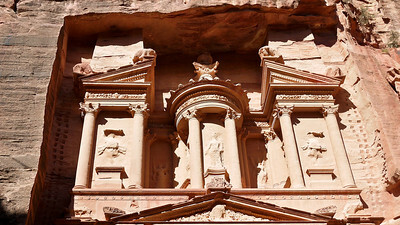 Details on the Treasury in Petra, Jordan in the mid-afternoon sun. 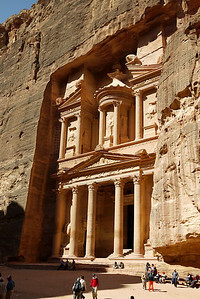 The tall treasury in the sunlight in Petra, Jordan. 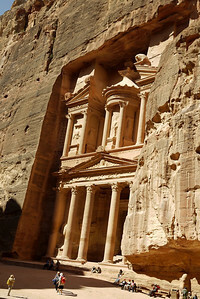 The upper portion of the treasury in Petra, Jordan. 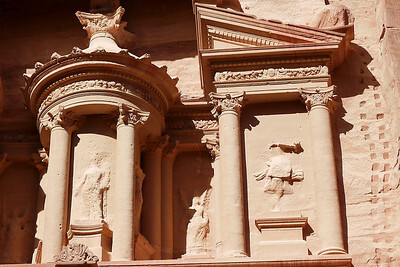 The beautiful and still intricately carved Treasury stands in Petra, Jordan. 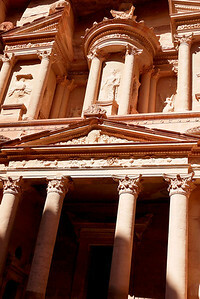 Me, at the Treasury in Petra, Jordan. 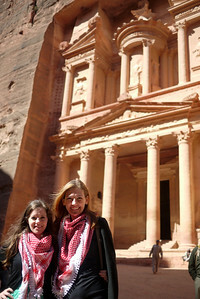 Jodi and Shannon at the Treasury in Petra, Jordan. 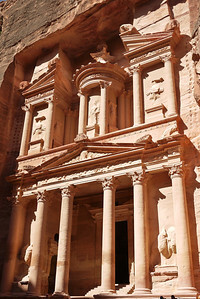 It's gorgeous and hard to stop photographing once you're at the Treasury in Petra, Jordan. 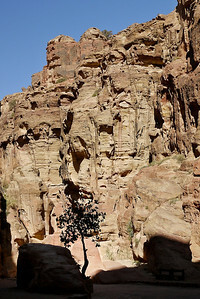 Besides the main tombs and structures, there are dozens and dozens of beautiful rock carvings throughout Petra, Jordan. 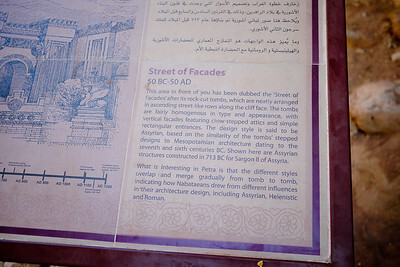 The Street of Facades in Petra, Jordan. 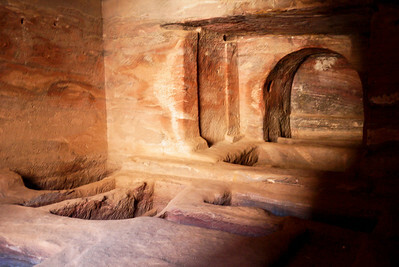 Inside one of the structures it is small but the details of the sandstone are more visible here! 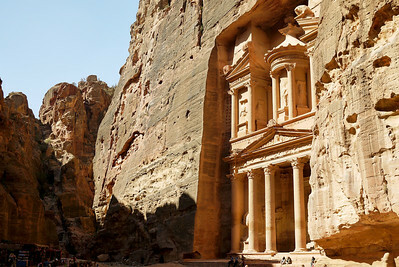 Petra, Jordan.